Why Pay For More PoE Than Necessary? Walnut City, Calif. – December 16, 2015 – Tenda Technology Inc.® a subsidiary of Shenzhen Tenda – an experienced, global brand of wired and wireless networking hardware – today announces availability of the TEG1009P in America. 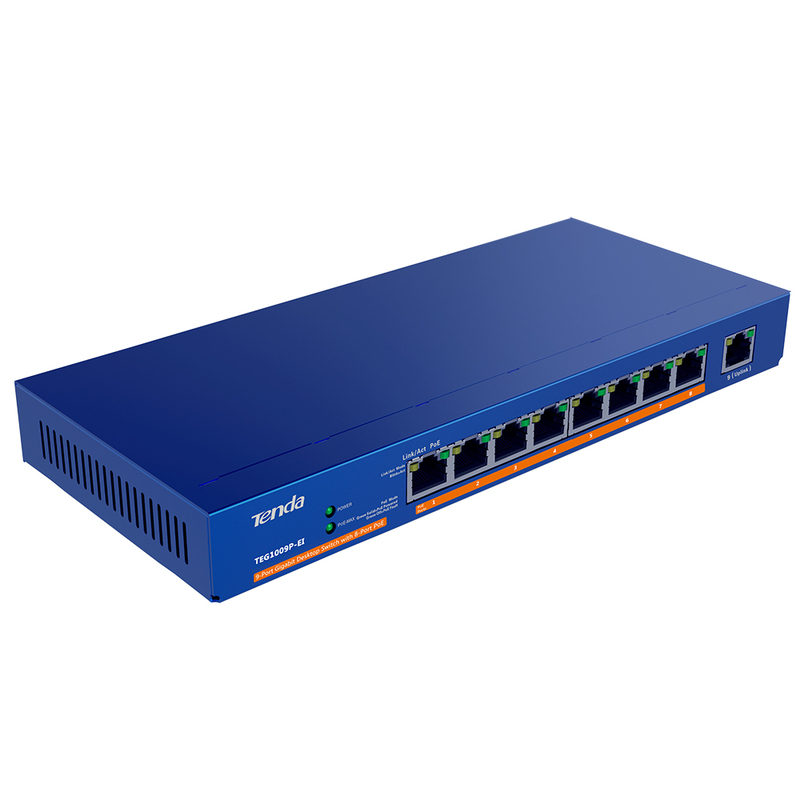 This is the 8+1 port Gigabit switch to choose for ease of use and maintenance. It features four flexible PoE ports, one lightning-resistant port, and simple plug-and-play setup. The TEG1009P provides nine 10/100/1000 GE Base-T Ethernet ports at the 802.3az (IEEE) standard. For PoE-enabled ports, it supports four 802.3af (15.4W) or two 802.3at (30W) ports. Dynamic power modulation, low consumption, minimal setup and maintenance, and fanless operation reduces the total cost of ownership of the switch and makes for a reliable, fast network. Ports 1 through 4 on the TEG1009P supply Power over Ethernet (PoE) that can supply power to access points (APs), IP Cameras, VoIP phones or other networked devices installed in hard to reach places. It can supply four ports at 15.4W for efficient devices or two at 30W for more power-demanding devices. The TEG1009P automatically detects the usage of PoE powered devices (PDs) to dynamically match the correct power output. This ensures safety for the device and power savings in the long term. Eight full-speed Gigabit Ethernet ports plus one uplink port, including the four autosensing PoE ports, offer flexible port combinations for most applications. Four PoE ports are sufficient for an eight-port switch without being superfluous. To protect against power surges, the ninth port uses a lightning-resistant circuit and 2-level lightning protection (4KV). All nine GE Ethernet ports support layer 2 wire-speed forwarding on each port, and meet the needs of a Gigabit WLAN. The TEG1009P has magnetic feet to grip metal surfaces and prevent slipping. It's also designed with hanging cutouts for versatile installation on smooth walls or ceilings. It provides power and data to hard-to-reach places via cat 5e PoE at distances up to 150m. The TEG1009 excels at networking access points, IP cameras, monitors, or any device needing data and/or power across a wider area of deployment. The TEG1009P 9 Port Gigabit Desktop Switch with 4 ports PoE is available at ASI, Amazon, Newegg and online distributors.